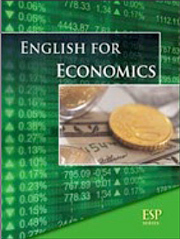 ESP: English for Economics contains four units focusing on supply and demand, pricing, international trade, and financial crises. The text book adopts authentic readings and develops a variety of tasks which facilitate real communication opportunities in academic and professional environments. Reading contains authentic articles written by the author. Each lesson begins with an overview of the topic and warm-up questions that activate students’ existing knowledge before entering a particular topic. Post-reading activities reinforce the comprehension of relevant technical vocabulary and key concepts. Vocabulary enhances acquisition of new terms with two categories: ESP, a list of technical terms which are subject-specific and thus more academic. General Vocabulary is used in a variety of situations. Language Focus includes two subtitles. Collocation is introduced in combination with corpus-based activities to provide students with both the skills and tools needed to discover useful and natural phrases related to general science concepts. Tasks are designed to apply the language and concepts introduced in each lesson. Task I and II develop the language and skills to describe and interpret economic data, while Task III provides opportunities to discuss and express opinions about important business and economics events..